The field-proven C-Gauge underwater measurement system offers sub-millimetric underwater measurements. The highly compact and rugged package comprises C-Laser, laser detector and deployment detector frame designed to fit onto even our smallest of ROV Systems. 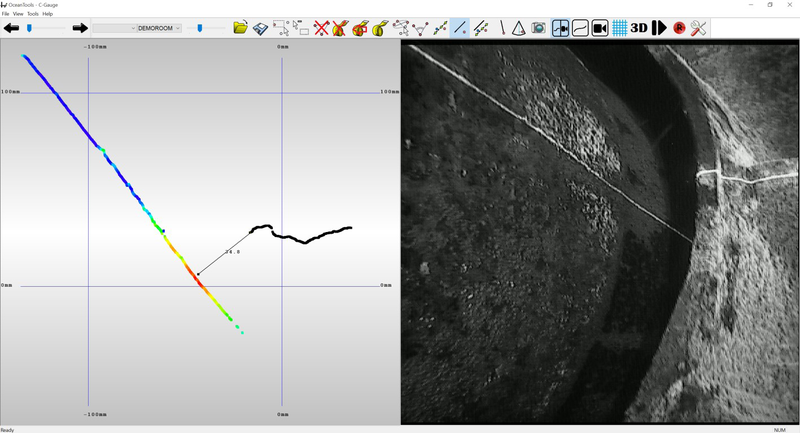 Subsea measurement applications include pipeline crack, gap and ovality inspection, with precise point to point distance, diameter, redial and angular measurements. C-Scan is an optical 3D scanning system that may be used to generate accurate dimensional measurements from internal and external scans. Target applications include caissons, pipes, piles, flanges anodes and other subsea structures. The laser triangulation system takes measurements 15 times per second, generating 700 discrete data points per scan, and may be rotated through 360˚ to build up a complete 3D data point representation. A range of software tools allow data manipulation, visualisation, measurement and export to CAD package.